He looks like a simple fish. Anyone that has seen The Little Mermaid knows better though. Flounder is the best friend anyone could ever have! Throughout the entire film, he has Ariel’s back. When Glut the Shark tried to eat both of them for dinner, he helped Ariel escape. When Ursula transformed her into a human, but took away her voice, he helped deliver important information to her. He even sang some backup vocals to help her smooch her crush, Prince Eric. 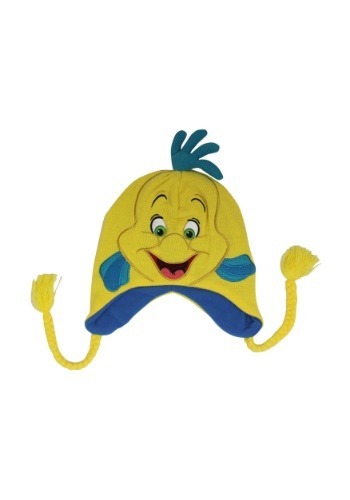 Now, Flounder can have your back too when you wear this Flounder Peruvian knit hat! This Flounder hat is officially licensed by Disney and is inspired by the best little fish friend that lives under the sea. It has an acrylic knit exterior and a fleece lining. That means it’s an extra cozy choice for those chilly winter months! The exterior has Flounder’s face designed into the front and it even has a pair of adorable fins on the sides. The top has a little blue dorsal fin and side tassels add a little fun flair to the look. You can wear this with your Ariel outfit or just use it to keep warm during winter. Either way, Flounder will be ready to join you on any adventure.